NEW BRITAIN - Eighteen teachers from Northeast Normal University in China, visited the city’s CREC Academy of Science and Innovation on Friday to learn about developing a STEM curriculum. The school where the group teaches is in Changchun, China. They arrived on Tuesday and will be visiting Connecticut schools until Jan. 30. The purpose of the visit is to explore ways of education in the United States. Each school they visit informs them of a different topic. The group was interested in careers in science, technology, engineering and math (STEM), which is why they visited the Academy of Science and Innovation at 600 Slater Road. This is the second time the school hosts a group of teachers from a Chinese Training Delegation. The first group visited the school in November 2017 also with the intentions of learning STEM instruction. 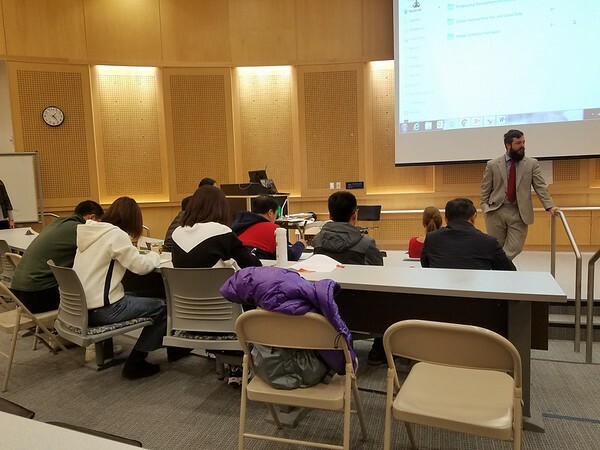 The Chinese professors visit the Connecticut schools through a program run by Daniel Gregg, the director of international programs at the Connecticut Association of Schools. “They are very interested in how we teach,” Gregg said. Friday’s plan was to go on a tour of the Academy of Science and Innovation and learn about how to better integrate science and technology into the classroom. The main goal was to observe STEM instruction in the American secondary school and how STEM curriculums are developed here. Scot Peaslee, blended personalized learning coordinator at the Academy of Science and Innovation is in charge of the ways in which students use technology in school. He gave a detailed presentation to the Chinese group about Schoology and Hapara, learning management systems used at the school. Robert Polselli, Head Coach of Robotics at the Academy of Science and Innovation said he always enjoys meeting educators from China. Polselli’s goal is to hopefully create collaboration between Academy of Science and Innovation and Chinese educators. “Ideally I would like my students to learn Chinese culture, go to china and have a really incredible experience,” Polselli said. To learn more about the Academy of Science and Innovation visit or call . Karla Santos can be reached at 860-801-5079 or . Posted in New Britain Herald, New Britain on Sunday, 27 January 2019 21:32. Updated: Sunday, 27 January 2019 21:34.